I've been waiting....... and waiting to feature this blog post and now that I am, my excitement is overboard. It's a special one for me and already a top favorite of mine for a couple of reasons. First, I'm a proud ambassador for Mirina Collections, which no doubt makes a wonderful start to the New Year. Second, I'm in love with all of their unique designs that are handmade and fit to make a statement everywhere you go. Third, I've got a special code that you can use to get yourself one (two or three) because I'm 100% positive you'll fall in love with them like me and will want to have the whole collection. 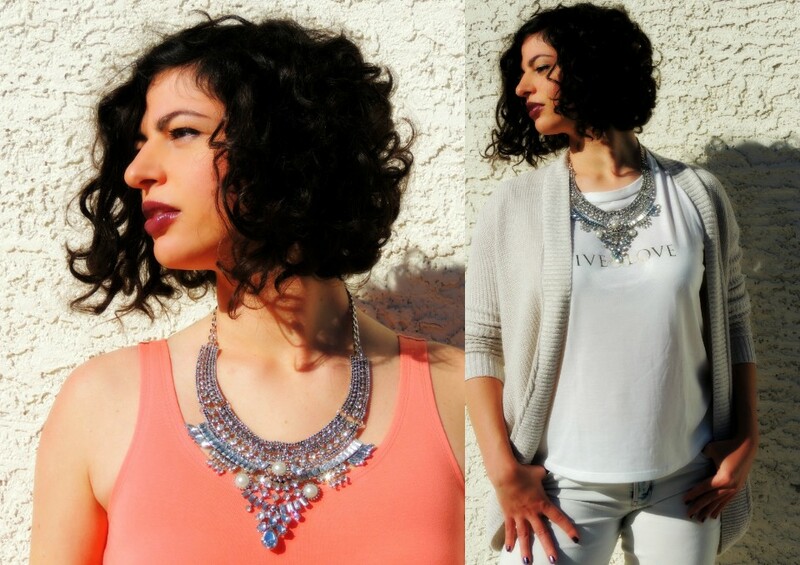 I've styled two different looks, one casual and one dressy, to give you some inspiration of how you can rock your statement necklace. 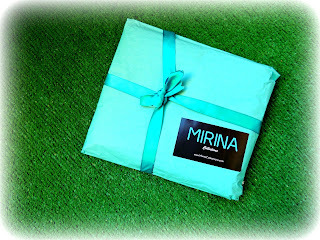 If you aren't familiar with Mirina Collections yet, I'm here to enlighten you. They're a NYC brand that makes the most gorgeous jewelry designs by hand, which is incredible and mesmerizing at the same time. As you can see their statement pieces are inspired by the Roman empires and the queens that ruled in the past, which is why each piece is big, shiny, and all you really need to add to any outfit of yours. Not only that, but they have choker necklaces, rings, earrings and sunglasses to choose from; just by looking at them on their site, you can tell that the pieces are great quality and worth every penny. From the first glimpse I fell in love with them! What I love about my necklace is that it's not too overpowering, heavy to wear, or "in your face." I mean, it gets attention - good attention, but it's not taking away from my outfit, but quite the opposite, it brings out the unique qualities of my fashion choice while making me feel like a million bucks. Gorgeous design, high quality, hand-sewn jewels, all for a very reasonable price. Casual or glamorous, whatever your choice of fashion that day, this necklace is a perfect staple piece. 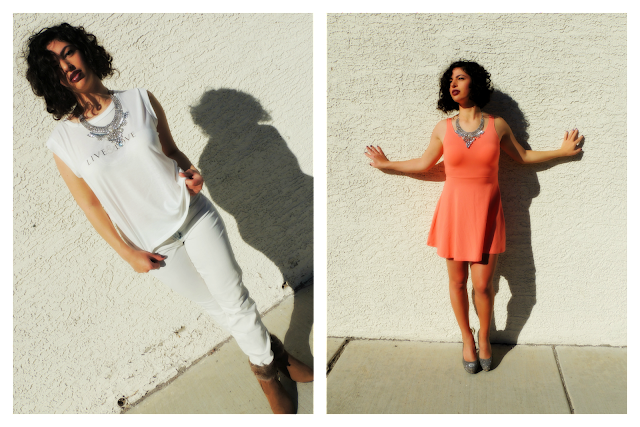 Here are the two looks I styled with my "ANDY" (not my boyfriend), that's the name of the necklace.LOL! As you can see you don't need any other accessories because this necklace brings all the shine and beauty to whatever look you're going for. Even a casual look like the one I did with jeans, tank top, and cardigan can become glamorous in an instant. Also, for a special night out you can add this necklace to any dress and you'll sure make a statement and most likely get compliments all night long. Perfect, right? This is what the package looked like before I opened it. I was so excited to rip it open that I'm still wondering how I managed to take a photo of it. Isn't it adorable? I'm really loving the turquoise and mostly what it's inside of it. When you purchase yours, let me know which one you picked? 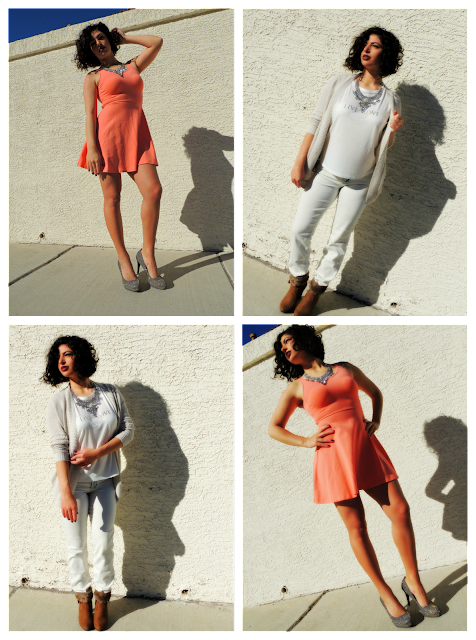 Tag me on Twitter or Instagram, both @FashionRadi and I'll be sure to follow, like and re-tweet your photo. Have a lovely day! I'll see you really soon. Bye, bye! Thanks! Ok, I'll check it out! Thank you! It's pretty, isn't it! Awwww thanks that's really sweet! Gorgeous necklace babe. You are sooo gorgeous! Have a fabulous weekend! Thanks, gorgeous. I appreciate the love! That means so much, thanks a million! So glad you love it, thank you! 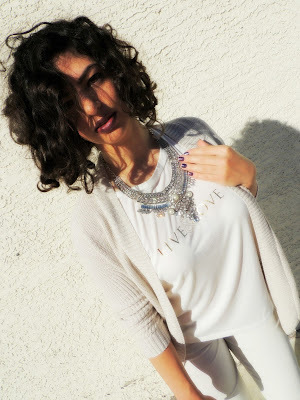 Your 'Andy' statement necklace from Mirina Collections is beautiful I also love the coral coloured dress and the "Live Love" graphic top. You look pretty in both outfits. Means a lot. Thank you for stopping by!!! Amazing statement necklace! Such a gorgeous and unique piece! I agree, it's my most unique and treasured piece! Such a great statement necklace, goes pretty much with everything!! True, anything and everything!!! Love it! Good outfit! I really like the dress. Thanks! Yes, let's follow each other! STUNNING! Great styling babe!! Have a wonderful week! Thank you! Yes, I just followed you! Nice necklace, dear! Lovely photos, too! You look fab! The necklace is extremely gorgeous. Have a great day ahead! gorgeous!! love your outfits!! and than you for stopping by on my blog! I appreciate it Franko! Thanks for your comment! You're welcome! I'm following you as well! Wonderful post! I love the two ways you styled the necklaces, they both look so chic. It looks good on you! You look so chic! This necklace is very good because it fit to many outfits. I like this kind, elegant, no very colorful. I'm so glad you like it, I totally agree with you. Thank you for following me. I followed you back!